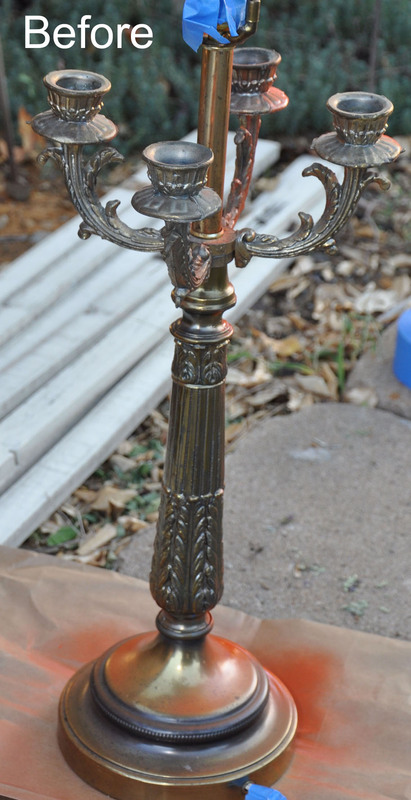 The last time I was up visiting my mom and sister in Oklahoma City, mom sent me home with a 'vintage' brass lamp. I grew up with this lamp and now the brass was spotted and discolored. I like to think that I've aged better than the lamp. I offered it to Jeff when he was home and he assured me that neither he nor Celia wanted it. Next I offered to my DIL, Lorna. By then it had occured to me that paint could really help this lamp. Luckily I remembered to take the before photo before we had painted the whole thing. You may notice that it's the same orange that I painted the light fixture in my dining room. It's what I had on hand in the garage and this color works in Lorna's living room. Later, if/when she wants it to be a different color she can repaint it. Here it is wearing a borrowed shade so you can see how it looks with fresh paint. It took all of 10 minutes to turn a sad old lamp into a happy eye-catcher. Don't you just love what you can do with paint! Great job with the paint. I have a fixture that needs painting badly. The brass needs to go away quickly as we’ve just bought new ss appliances and changed out our cabinet hardware to brushed nickel. Can you tell me what kind of paint you used and did you have to do any prep work to the lamp. I was completely lazy and just used a Krylon spray enamel. You could hit your fixture with a primer and that would probably be a good idea butI was completely lazy and just used a Krylon spray enamel. I like a glossy finish and chose that but there are a variety of choices on the shelves. Love the lamp!!! I can see some spray paint and recovering shades in my future!!! Looking forward to seeing you at Market!! Wow what a changeover. I simply love the work done by the paint on the sad old lamp. I’ll never forget this idea in the future. Thanks for the inspiration. Loss for Jeff.